How to Play HD Movie/Videos MTS/M2TS, MKV on Samsung Galaxy Note 4? Preorders of Samsung Galaxy Note 4, the primary competitor of iPhone 6/6 Plus were set to begin on September 17, 2014 despite the lack of an announcement of exact release date (early October from rumors). And, the tutorial aims to point a convenient way to play HD videos AVCHD, MTS/M2TS, MKV on Samsung Galaxy Note 4 making use of a Galaxy Note 4 HD video converter for this great phablet owner-to-be. How to Play HD Videos on Galaxy Note 4? 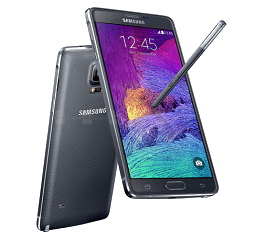 Convert HD movies/videos to Samsung Galaxy Note 4. Inheriting from Note 3, Samsung Galaxy Note 4 features the same 5.7-inch screen and soft-texture rear cover, but a superb Quad HD AMOLED Display with a resolution of 2560x1440 (515 ppi pixel density), driving you to enjoy crystal images with fluent and vivid color. 2.7GHz Qualcomm Snapdragon 805 processor greatly fasten the running speed and advanced S-Pen, high capacity battery, Multi Window usage make Galaxy Note 4 faster, brawnier and sharper than previous generations of Samsung smartphone. Compared with iPhone 6 (4.7-inch display, 750 x 1334 resolution) and iPhone 6 Plus (5.5-inch display, 1920 x 1080 resolution), Samsung Galaxy Note 4 are recognized as better phablet for reading and videos/movies playback. It is undeniable that all of us can derive tremendous viewing experience from large screen and HD display of Samsung Galaxy Note 4, especially when watching HD videos and movies. Meanwhile, errors to play HD videos, M2TS/MTS, AVCHD, MKV etc, on Samsung Galaxy Note 4 will emerge since formats are incompatible with Note 4 supported videos like MP4/H.264/WMV. If you would like to play HD videos and movies copied from DVDs/Blu-ary, downloaded from online movie torrent websites or recorded by HD camcorders with Note 4 on the move, it is necessary to get help from a professional HD video converter for Samsung Galaxy Note 4. WinX HD Video Converter Deluxe enables you to convert any HD videos to almost all Android devices (Samsung Galaxy Note 4, Galaxy S5, HTC One etc.) at a very high speed and delivers possible highest quality. 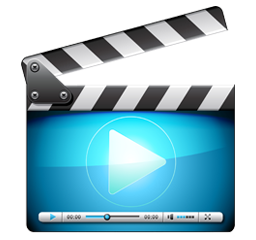 The editing tools can help you crop, trim, merge videos and add subtitles for videos. Also, you can customize audio/video parameters, bit rate, frame rate, resolution etc. 1. Import a HD video, for example MKV file to WinX HD Video Converter Deluxe by hitting "+ Video" button. 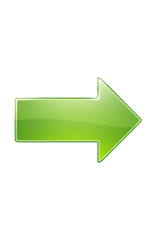 The video source can be other HD videos or general videos as well, such as MTS, MOD, TOD, MPEG HD, MOV, AVI, FLV, WebM and so on. 2. Output profile window pops up the moment HD video is added. Get Device Profile category > Android Mobile > to Samsung Mobile Video > Samsung Galaxy Note 4 (H264/MPEG4). 3. Save converted HD video to destination folder and hit RUN button to start HD video to Galaxy Note 4 conversion. After the video is completely converted, transfer it to Note 4 and you can play HD videos on Samsung Galaxy Note 4 smoothly. 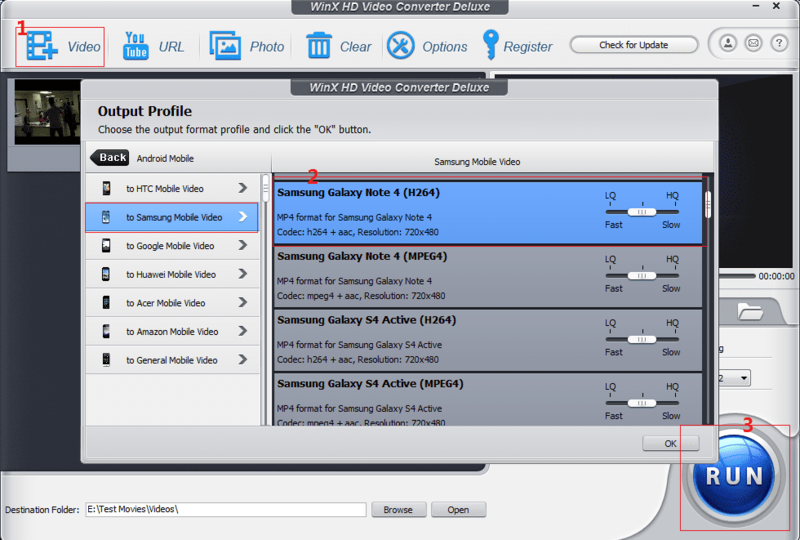 Besides HD videos to Galaxy Note 4 and other Samsung devices, WinX HD Video Converter is capable of converting HD videos to MP4, MOV, AVI, WMV, YouTube FLV etc, and iPhone/iPad/PSP/Kindle Fire/Surface Pro etc with trimming/cropping/adding subtitles and adusting parameters (such as bit rate, aspect ratio, resolution, channel and more). WinX HD Video Converter Deluxe – Convert HD videos AVCHD, MTS/M2TS, MOD, TOD, MKV etc, to Samsung Galaxy Note 4/Note Edge/S5, iPhone 6/6 Plus/5s, HTC One, Kindle Fire, Google Nexus, PSP, Xbox etc, with ease for playback HD videos and movies smoothly on those devices smoothly.